A screenshot from the documentary "Foot by Foot" by Doug Swift. David Mitzel believes people have stereotypes about Appalachia– about Appalachian attitudes, Appalachia culture, and even Appalachian art. Mitzel organizes the annual Zanesville, Ohio, exhibit “Foot by Foot,” which celebrates art depicting Appalachian Ohio communities. 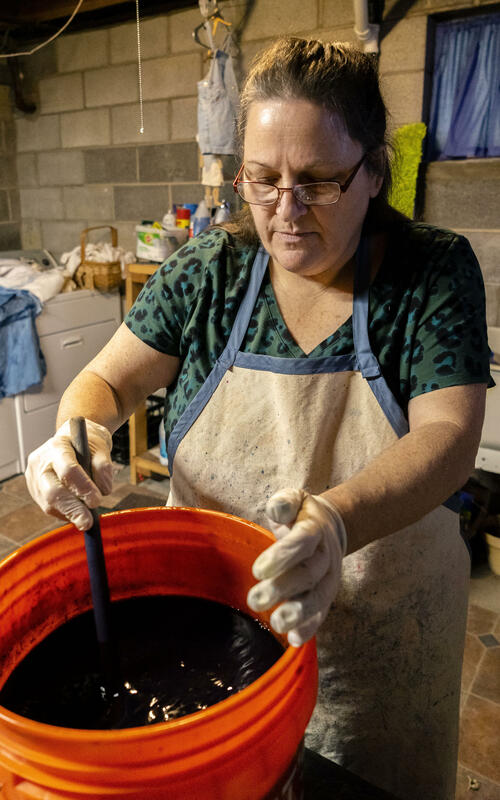 Mitzel distributes 12 inch by 12 inch canvas or gesso boards to artists in Ohio counties as far south as Athens, and as far north as Coshocton. Completed artworks are then delivered to an opening event and the exhibit forms a patchwork vision of the region. 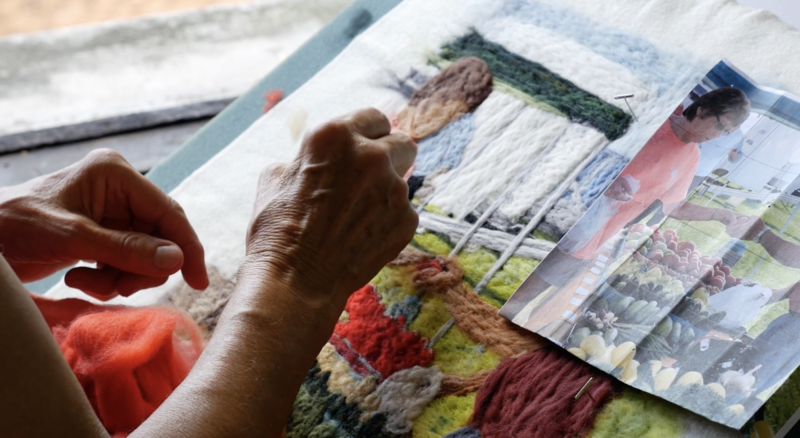 In the accompanying mini-doc, I selected five participating artists to film in-process as they prepared their piece for the 2018 “Foot by Foot” exhibit. My objective was to illustrate the diversity of Ohio’s Appalachian region. A screenshot from the documentary “Foot by Foot” by Doug Swift. Jane Evans is a sheep farmer who works in fiber arts and plays saxophone in her spare time; Paul Emory restores buildings in downtown Zanesville, Ohio, and sometimes paints the ones which are about to be demolished; Michael J. Rosen works in ceramics and has created a kind of nature reserve in Perry County where he meditates on ecological dilemmas and has begun to etch haiku into his plates. 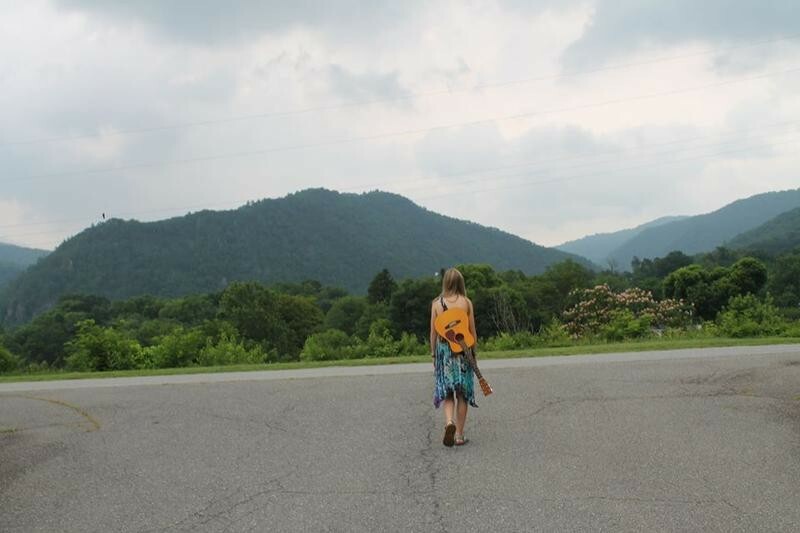 The documentary short also contextualizes the “Foot by Foot” project within The Winding Road initiative, which, in addition to the arts, seeks to highlight other aspects of Appalachian Ohio, such as heritage, recreation, local foods and more. She made friends with a woman who was quadriplegic, although she had some use of her arms. This woman introduced Gilchrest to weaving. “I don’t have time to think about what is or isn’t, the good or the bad, and dwell on things I can’t change and can’t control,” she said. “It went from being an essential, ‘you have to do this,’ to being a hobby,” she said. 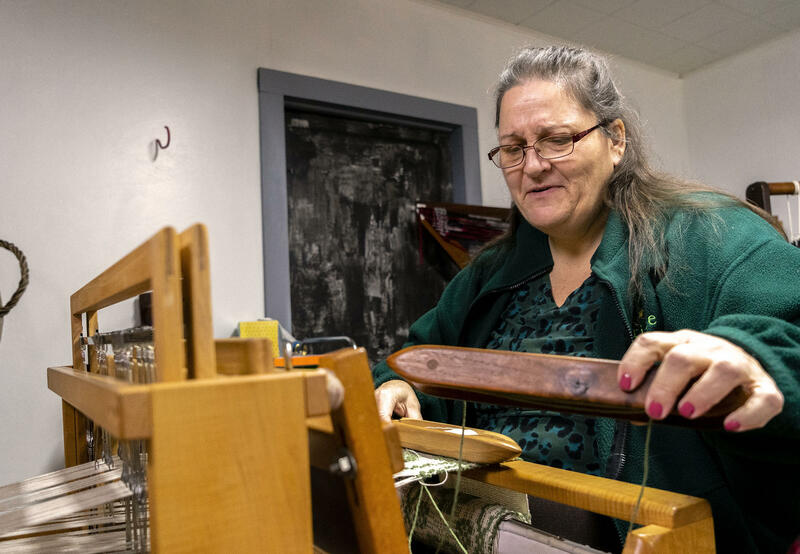 “When I sit down at one of those looms and I start creating a piece of cloth, I feel connected to my ancestors. I feel connected to the people that have come before,” she said. It is a hand-woven rug for one’s coffee mug. 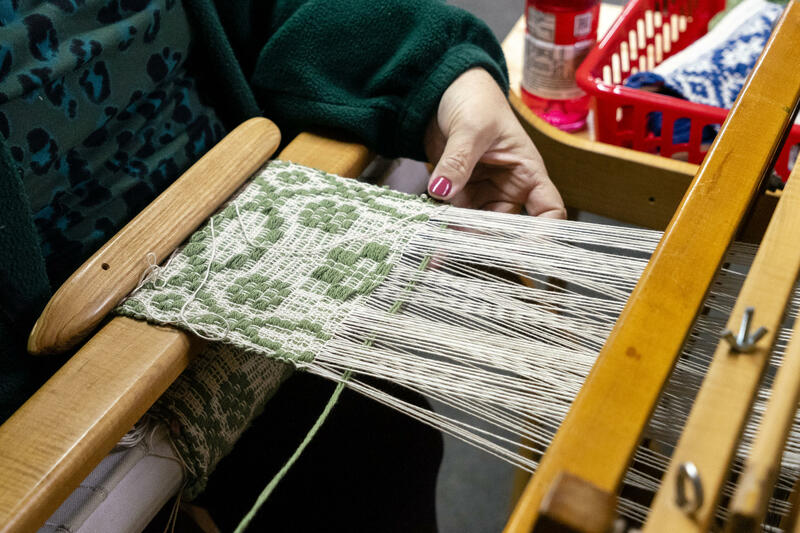 Gilchrist teaches “Mug Ruggin It” as an informal class at several West Virginian art festivals and fairs, where people can weave the rugs themselves. It’s a spinoff of a traditional Appalachian rag rug, just downsized. Over the past five years, about 3,000 people have been through the “Mug Ruggin It” program, Gilchrist estimates. 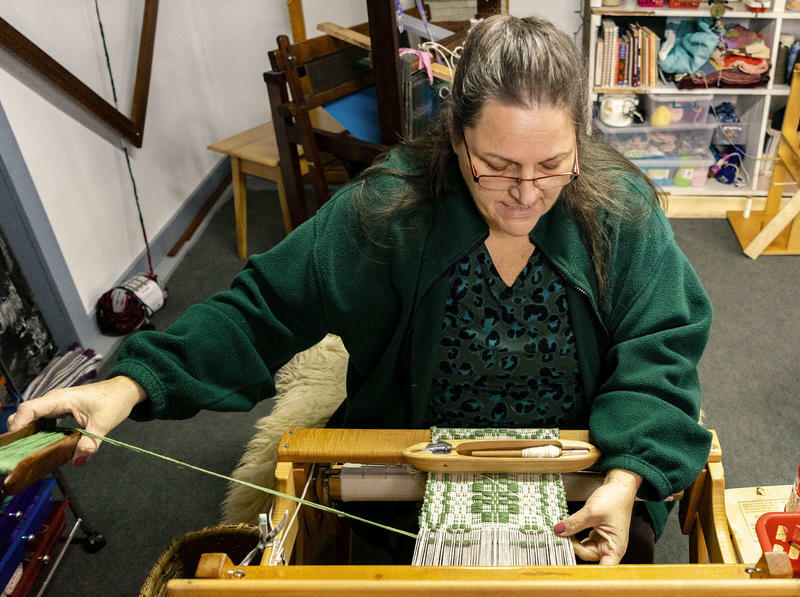 Some people might caution turning a hobby into a livelihood, but Gilchrist says it’s not work for her. She says she knows she will never get rich off it either, but that’s OK. It was April and snowing when Aura Broida Fontánez came to West Virginia, and there were no leaves on the trees. It reminded her of the trees in Puerto Rico, when the leaves were swept away by Hurricane Maria. Months after the hurricane, Broida arrived as an intern at Harmony Farm, a 5-acre farm in Morgantown that grows around 60 different crops, such as tomatoes and microgreens. She met the farm’s owner, Sky Harman, at a community garden in Vieques, an island around 8 miles east of mainland Puerto Rico. After the hurricane, Harman flew in with the Climate Justice Alliance and Organización Boricuá to repair and rebuild farms across Puerto Rico. Broida lived on Vieques when both Hurricane Irma and Hurricane Maria hit in September 2017. Now, they both work on the Morgantown farm. Broida is learning to be a farmer, a job she started wanting due to the lack of fresh food in Puerto Rico, especially following the hurricanes. Damage on the island of Vieques, Puerto Rico, after Hurricane Maria last year. “It’s a large learning curve, but she’s doing really well,” Harman said. One of the first adjustments she had to make was to the weather. “I was not mentally prepared for how cold it was. I was surprised at the snow,” Broida said. Puerto Rico has no winter, only a dry season and a wet season. As West Virginia grew warmer, and the leaves returned, Broida found herself surrounded by more and more fresh food. Her work varies by the day. She does things like weeding, fertilizing, mowing and planting. She also participates in the Bridgeport and Morgantown farmers markets. 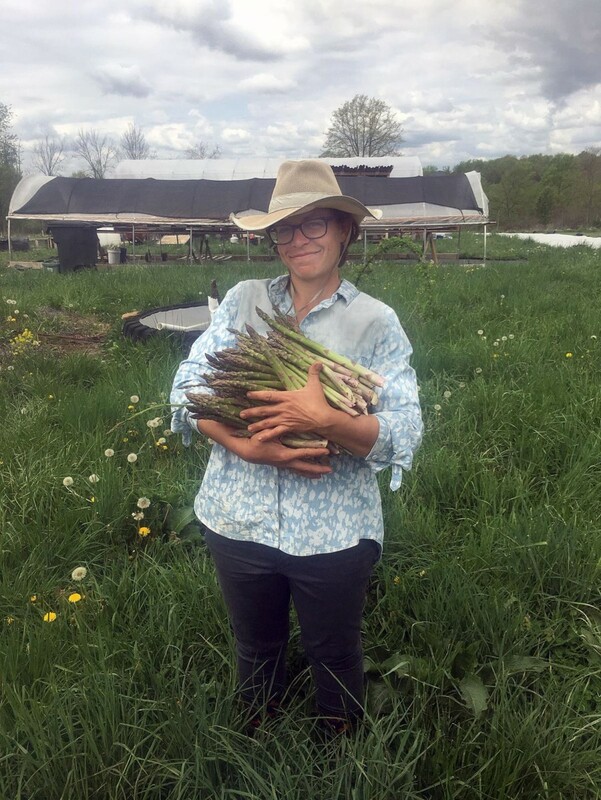 “I feel like I am learning quite a bit, like [about] the rhythm of a larger food production system,” Broida said. In September, she left behind her house to stay with the owners of Villa Coral Guesthouse, a business where she had worked at the front desk. Their home, in a different part of Vieques, was better suited to withstand hurricanes, Broida said. Before Maria, Broida helped with preparations, what she called “hurricane chores.” When Hurricane Irma struck two weeks before, Broida said it swung mostly north of the island. Broida said she was grateful for that first storm. It helped prepare them for the larger one to follow. On the morning of Sept. 19, 2017, Hurricane Maria was only a breeze. At around 8 p.m., Broida said, the storm fully hit. The storm shutters prevented Broida from seeing the storm, but she could hear it. Mireya Padín Nadal, the owner of Villa Coral, credited Broida with helping before, during and after the hurricane. Padín said Broida helped do things like put up storm shutters before Maria hit. During the storm, she helped roll furniture to block doors, and helped when wind forced water through the storm shutters. Afterwards, she collected food and water and cleared trees. Padín’s business still does not have a working landline phone. Power did not come back to the guest house until late February. Padín’s home received power in March. They didn’t have running water for around a month, and then it was available off and on. Broida’s own home, which she was caretaking for a friend, was damaged by the hurricane. The windows were broken, the inside damaged by wind and water. Another house, which she had been planning to soon rent, fell in on itself. Without phone reception, she was unable to contact her mother, who lived on the mainland. Still, she helped others in Vieques. She did work for a governmental administration addressing mental health following the hurricanes. She worked at kitchens making food for those in need, she put up tarps, cleaned yards and houses, and worked at the community garden, where she met Harman. Broida expressed an interest in farming to Harman, and Harman told her about his farm’s internship program. Her internship ends in November. Broida said she’s not sure if she will stay another season in West Virginia, or work and learn at farms in other countries, like Cuba or Peru. For now, Broida is enjoying West Virginia. She’s gone swimming in Cheat Lake, hiked at Coopers Rock and plans to explore the bike trails of West Virginia University’s Arboretum. “I’m enjoying seeing all of the different blooms and getting to know the birds,” Broida said. This article was originally published by the Charleton Gazette-Mail. We’ll start this episode with someone who is now charged with helping to give Appalachia an economic boost. President Donald Trump recently appointed a new federal co-chair of the Appalachian Regional Commission, or ARC. Tim Thomas spent the past three years working for U.S. Senator Mitch McConnell out of Kentucky. Inside Appalachia host Jessica Lilly spoke with the newly appointed ARC leader to find out what vision he sees for our region, and what approaches he plans to try that may be different from things the federal government has tried in years past. The coal industry’s decline is felt in many school districts across coal country. Tax revenue from mining has decreased, along with the local economy, while rising electricity rates make it a struggle to keep schools open. But as Benny Becker reports, there’s no shortage of students who are trying to create a new energy future. Recent demonstrations in Arizona were just the latest in a series of walkouts, protests and pickets by teachers in four states from West Virginia to Oklahoma to Kentucky. Glynis Board reports on what the unrest among teachers could mean for schools, for labor, and for upcoming elections. In this episode we’ll also hear the voices of several students sharing personal stories about growing up in the mountains of rural North Carolina. The pieces were crafted during a summer program of the Partnership for Appalachian Girls’ Education (PAGE) for girls in grades 6 through 9. The youth in the program worked with facilitators to write, edit, and voice “digital stories” that say something about their lives. In this episode we’ll hear from Wrenn Treadway, Preslea Harwood, Megan Anderson, Katlyn Lewis, and Skyler Shelton. These students wrote, voiced, and produced their own stories as part of a summer project with a group called PAGE. It’s part of a series called Postcards from Madison County, which originally aired on WUNC. Kids in Charleston play soccer at the 25th annual Healthy Kids Day while volunteers from the WV State football team supervise on Saturday, April 21, 2018. Photo by Kara Lofton, WVPB. The small community of Montgomery, West Virginia, in Kanawha and Fayette Counties, used to be home to West Virginia University Institute of Technology, or WVU Tech. But the school moved to Beckley last year. Now, people in Montgomery are wondering how this change may affect the town’s economic future. But in the midst of these challenges, there is a bright spot. A new YMCA gym has opened there for families. The gym hosted an event recently, called Healthy Kids Day, aimed at teaching kids and families how to eat well and stay active through the summer months. West Virginia University students had an unusual way of decompressing during finals week this semester. Have you ever heard of Puppy Pilates? Recently, as WVU students were preparing for finals, the school’s student health center hosted a Puppy Pilates class aimed at de-stressing students before exams. We’ll also hear a piece that StoryCorps recorded a few years ago when they were in Morgantown, West Virginia. Gene Kendzior told his daughter, Jennifer, about her grandfather, who died working in a coal mine in 1967. Shortly after recording this interview for Father’s Day, Gene Kendzior passed away. Inside Appalachia is produced by Jessica Lilly and Roxy Todd. Liz McCormick edited this episode. Our executive producer is Jesse Wright. Our audio mixer is Patrick Stephens. You can find us on Twitter @InAppalachia. You can e-mail us atInsideAppalachia@wvpublic.org.